PP Stabiliser has been developed by Spa Plating to supress tarnishing in our product, PP Copper. PP Copper is most frequently used for building layers of shiny copper on non-conductive surfaces such as plastic, shell and glass. Although our PP Copper plates a beautifully smooth and lustrous layer it can, due to its reactivity, quickly become tarnished. PP Stabiliser not only suppresses tarnishing but also brightens the layer of copper plate. It must be made fresh and used within one week. 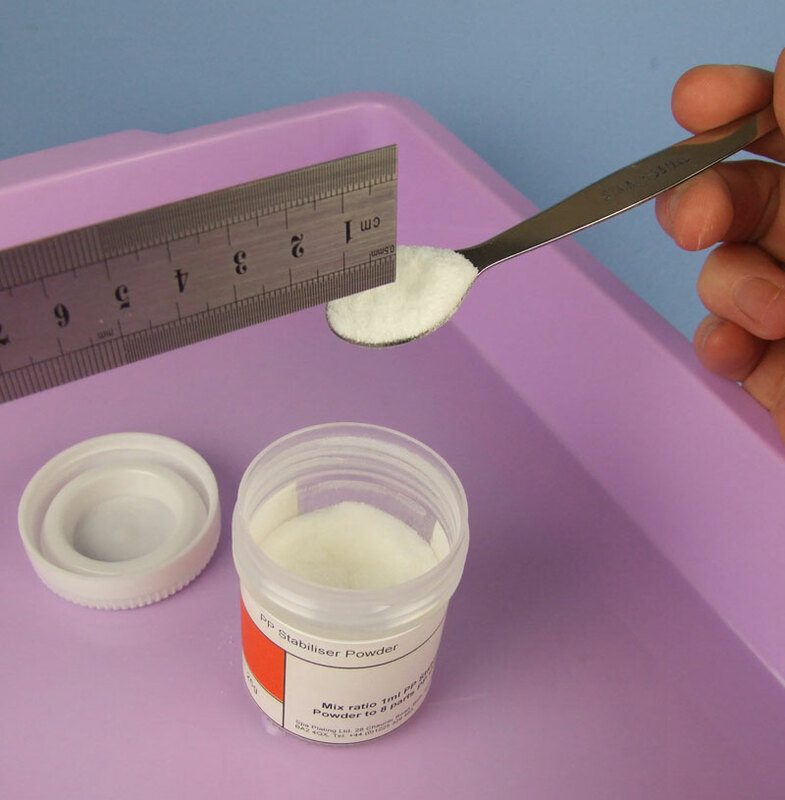 The ratio for mixing the PP Stabilising Powder with the deionised water is given in stage 3 of mixing process. 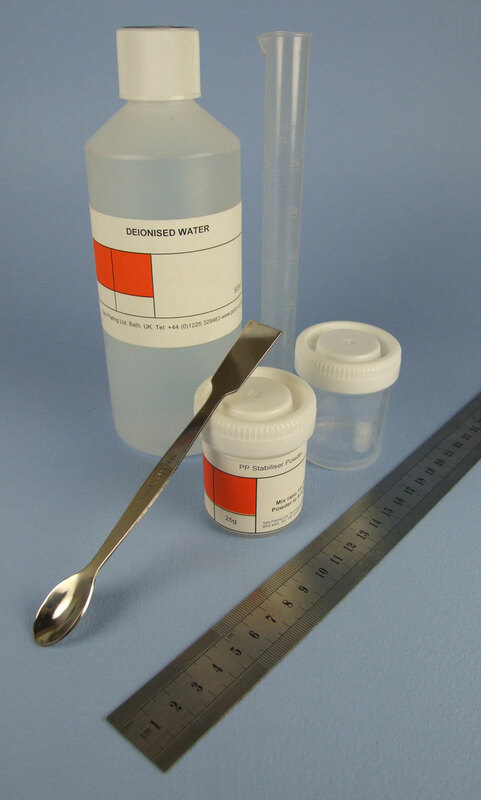 Deionised water, 25ml measure for measuring out the water, PP Stabiliser, Medium Beaker, spatula and ruler or plastic card for measuring out one level spatula spoon’s worth of PP Stabiliser. Measure out the right amount of PP Stabiliser by levelling off a heaped spatula full with a ruler or plastic card. 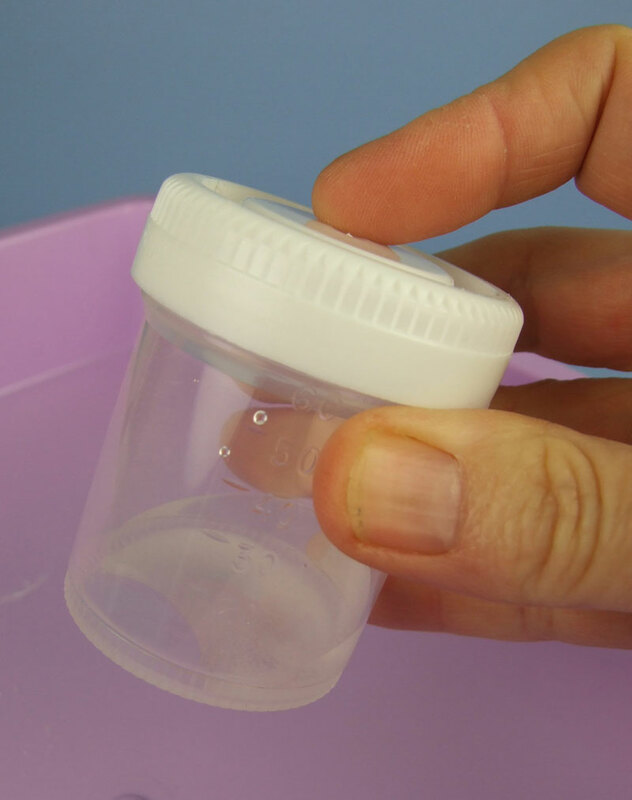 Place the Stabilser into the 60ml beaker. 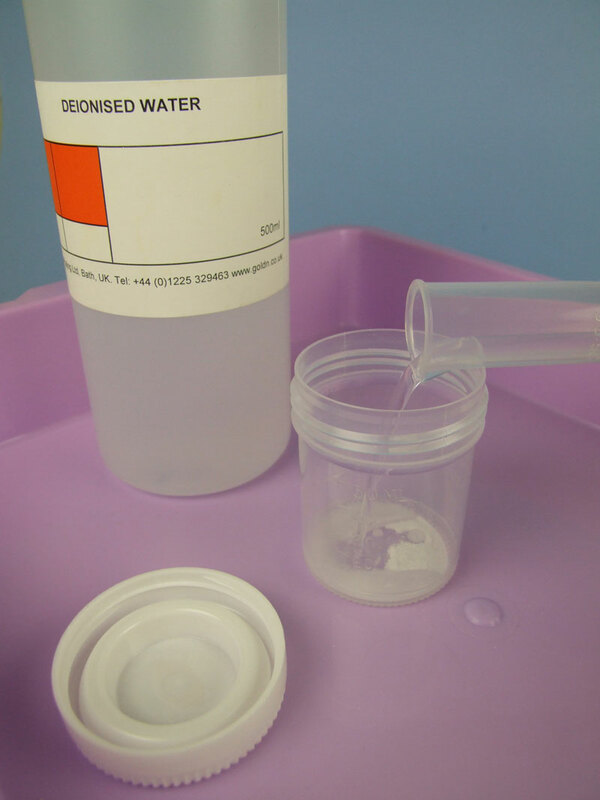 Measure out 8ml of deionised water and add it to the Stabiliser in the beaker. 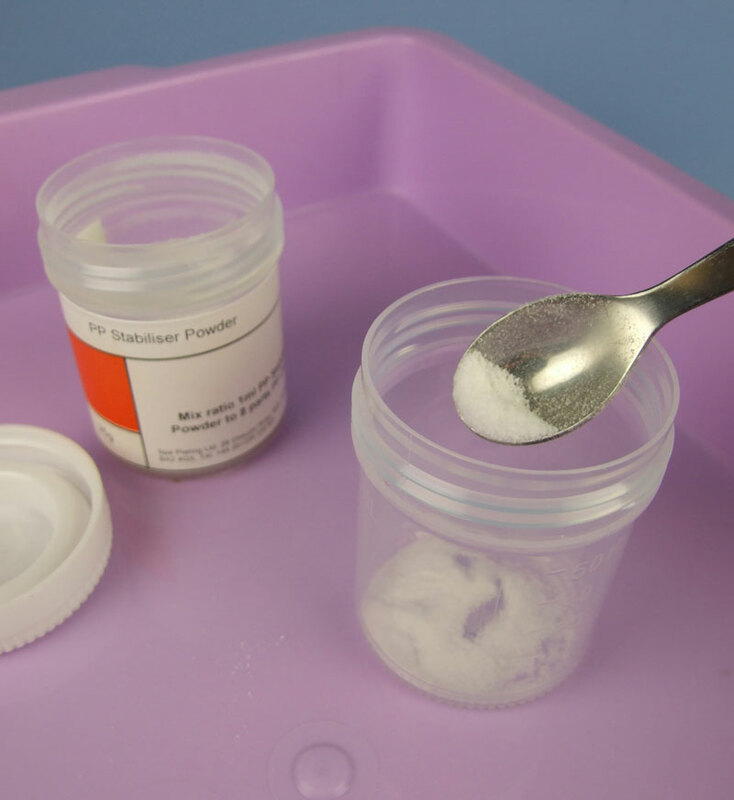 Once the water and the powder are completely combined, label the beaker clearly with the date it was mixed. 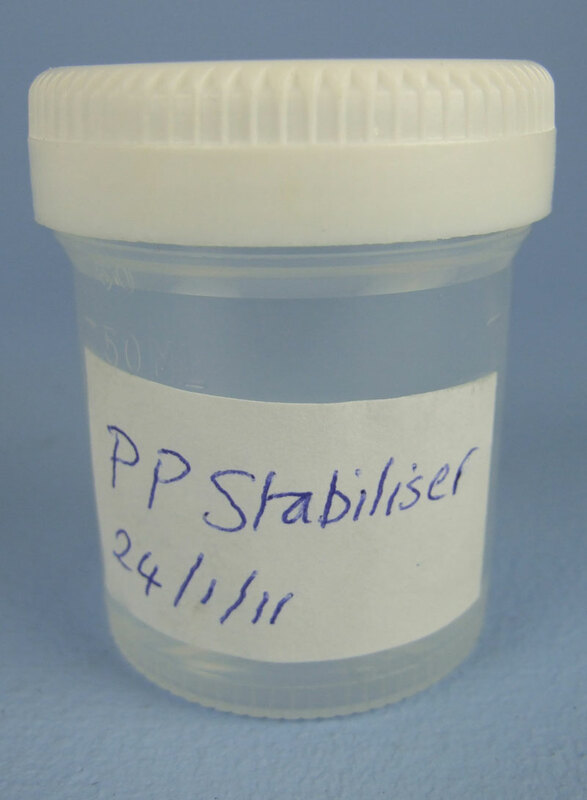 The contents can now be added to our PP Copper at a ratio of 1:10 so the amount of stabiliser prepared above should be enough for about 100ml of PP Copper.